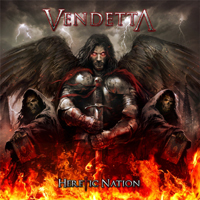 UK-based Vendetta has a style that is deeply rooted in '80s traditional metal, with crunchy riffs and melodic hooks. Traces of Maiden, Priest, Scorpions, Triumph and Saxon, among others, are eloquently placed throughout their 2nd album "Heretic Nation." The band mix melody with aggression, combined with great harmonies as well as a shitload of searing and soaring guitar leads! Their debut was good, but their new creation is far more advanced. It's heavier and more cohesive than "Tyranny of Minority," while still retaining Vendetta's trademark sound. The band has progressed immensely, and vocalist/guitarist Edward Box has fit into his dual role comfortably by delivering more passion to his vocals than on the debut. There's not a dud amongst the batch of songs on this CD. Every track has a catchy, melodic-yet-aggressive approach to it, due to dead-on marksmanship by drummer Lee Lamb, solid precision bass lines from Gary Foalle, and equal guitar mastery from Pete Thompson. "My Revelation" has been featured on Youtube for a couple of months now, and if you liked that song then the rest of "Heretic Nation" is just as tasty. Opening track "Delusion" has the band kicking off in excellent form. A melodic anthem with nice leads and a strong chorus makes it a great opener. Box brings his instrumentalist traits to the song "Skaro," based on the fictional planet of the same name from the British Sci-Fi television series Doctor Who. In addition to Vendetta, Box has penned two instrumental solo albums, thus proving that he is a guitarist to be reckoned with. "Glass Half Empty" radiates with Triumph-like qualities including great bass lines and Box's harmonious voice shining through, the middle part is reminiscent of a young Rik Emmett. "Killing Time" includes an awe-inspiring twin lead guitar solo by Box and Thompson that equal a Tipton/Downing shred-fest. "Face Your Demons" and "Powers That Be" have sort of a Testament-like quality, particularly the "Souls Of Black" period. "Heretic Nation" is a fun slab of traditional, straight up, balls-out heavy metal that has a long-lasting nostalgic metal quality to it that you can never grow tired of. Play it again!